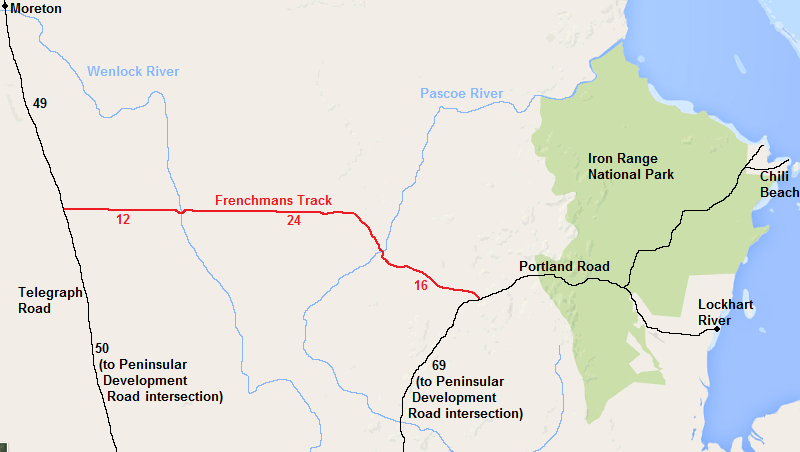 See our blog entry for completing Frenchmans Track here. 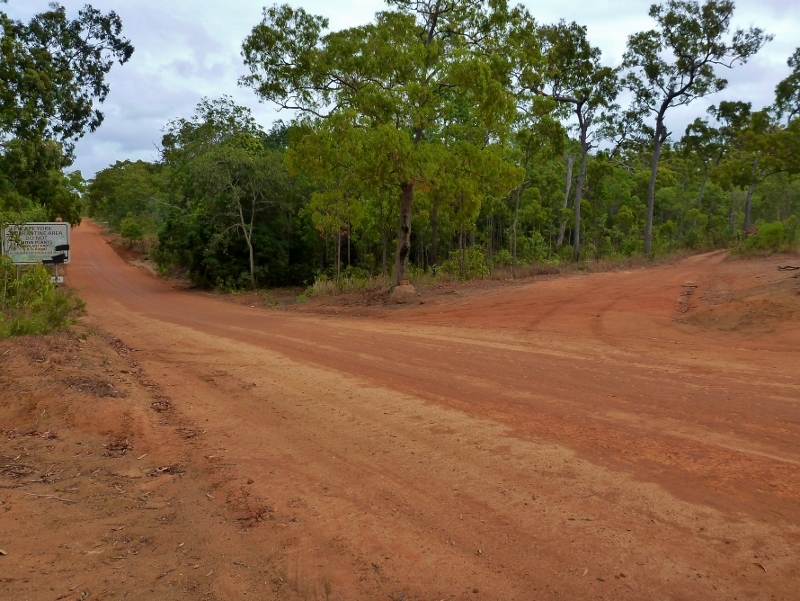 I was a little hesitant when deciding whether to tackle Frenchmans Track on our trip up Cape York since there was lots of conflicting information about how difficult the track was. We were on our own and some people thought it would be too difficult and would damage the car and shred the tyres. Others thought it would be a piece of cake. We ended up giving it a go and had some good fun doing it. Armed with that experience, I decided to write this article to help other folks who are thinking about tackling Frenchmans Track. As you will see below, whether you attempt Frenchmans Track or not will depend on your appetite for tackling the Pascoe River crossing. It’s by far the most difficult part of the track. The season is also important. Last half of the dry season is the easiest time to give it a go. 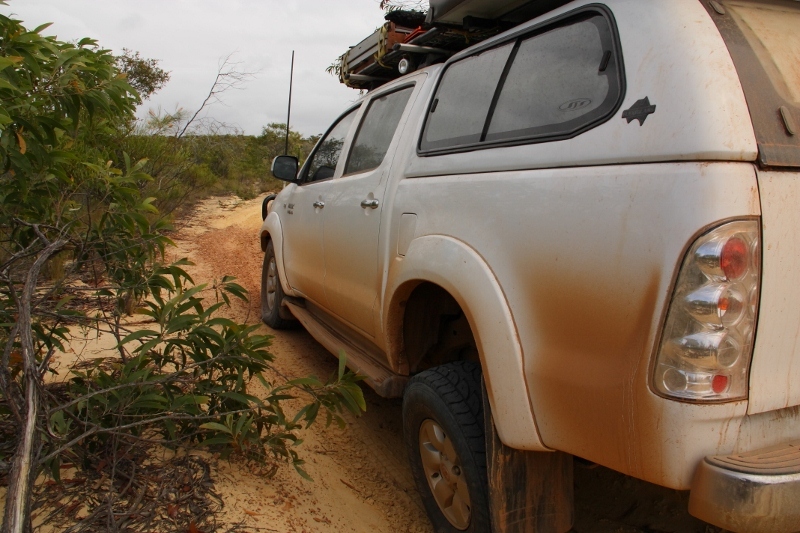 Note when I mention 4WD vehicle in this article I mean a proper 4WD – something with a chassis and a low range gearbox. 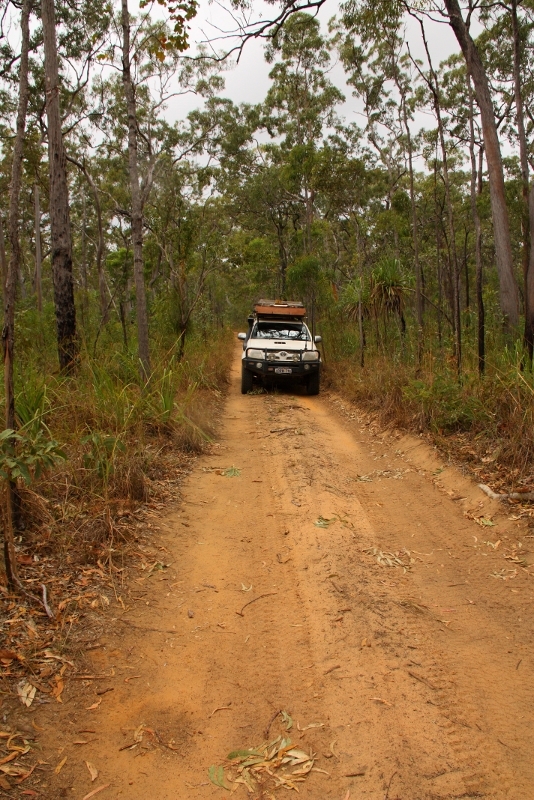 Frenchmans Track is located on Cape York Peninsular west of Iron Range National Park. It runs between Portland Road and Telegraph Road. The track is not sign posted. If accessing from Portland Road, the turnoff is located 69km up Portland Road from the Peninsular Development Road intersection. It is easy to find since it is just to the east of the signposted Yam Creek crossing. Frenchmans Track turnoff from Portland Road. 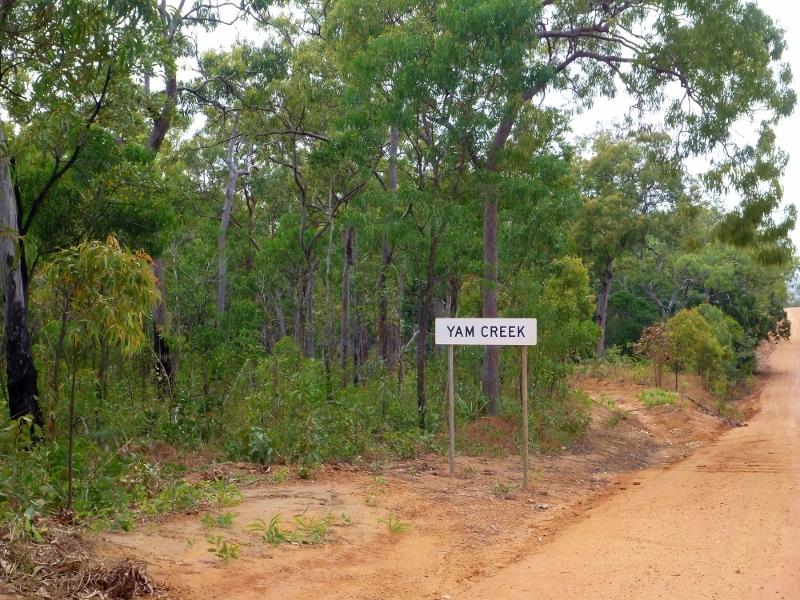 Yam Creek is the low point in the road further down. 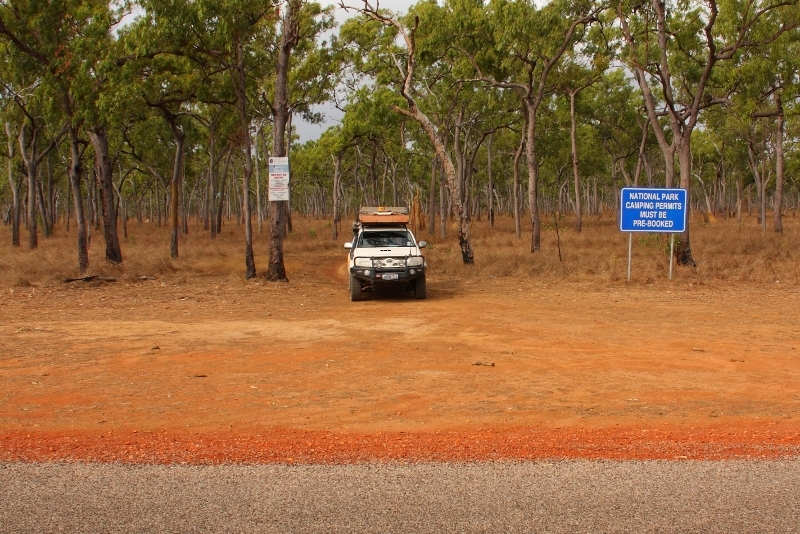 If accessing from Telegraph Road, the turnoff is located 50km north of the Peninsular Development Road intersection or 49km south of Moreton Telegraph Station. Most of Frenchmans Track is pretty tame. Long sections are flat, straight, easy going dirt tracks. There are a few watery bog holes but in the dry they don’t pose much of an issue. 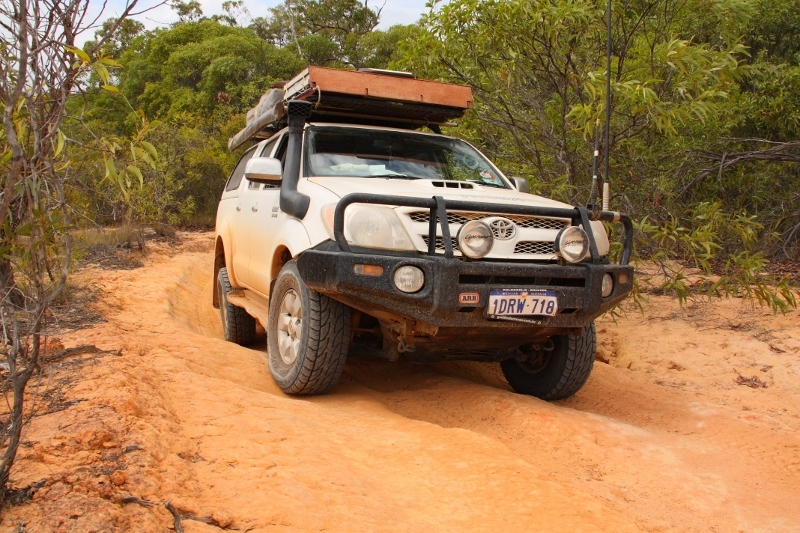 There’s a few rutted and uneven sections and step ups but nothing a standard 4WD can’t handle. Much of Frenchmans Track is like this. Pretty easy. This is towards the east side where it’s sandier and the vegetation is coastal scrub. Another easy section further west – a bit less sandy. 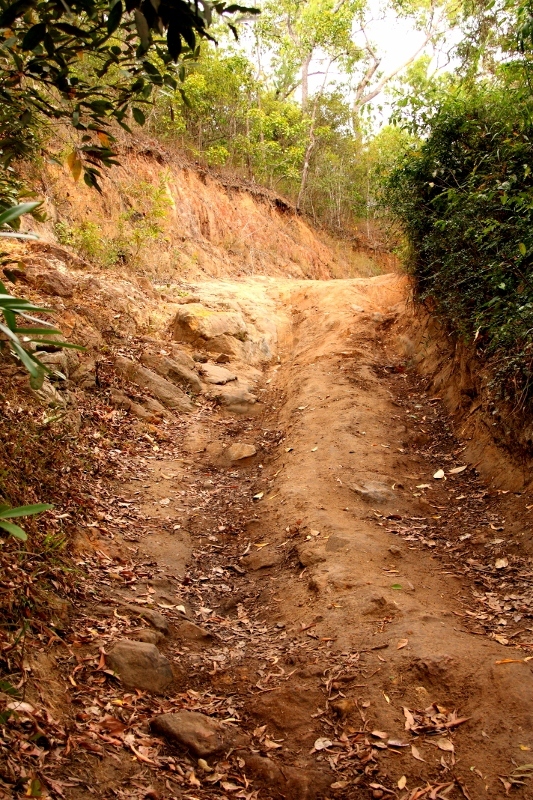 There’s a few washed out and rutted sections to negotiate. In the late dry the bog holes had a pretty firm base and were not deep. The bog holes may become an issue when they’re deeper and muddier, particularly if you’re towing. Under those conditions some winching may be necessary. 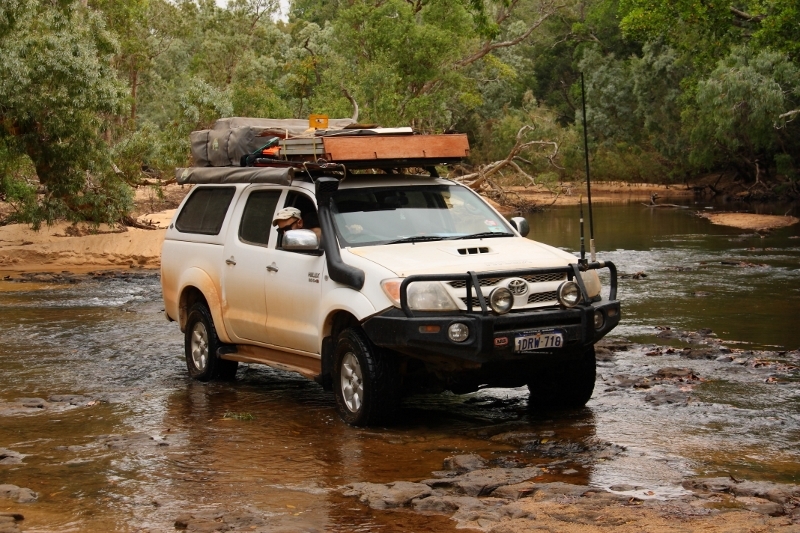 The Wenlock River crossing is 12km from Telegraph Road. The entry and exit into the crossing are pretty easy in the dry. Not too steep, not too uneven. Any 4WD could do it. 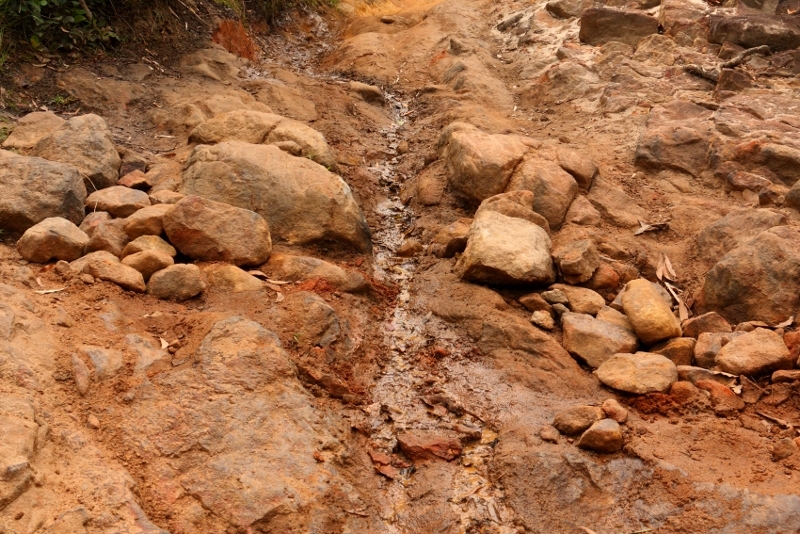 It can be difficult when wet and muddy because the track becomes very slippery. The crossing itself is also fairly tame – flat, firm and shallow. 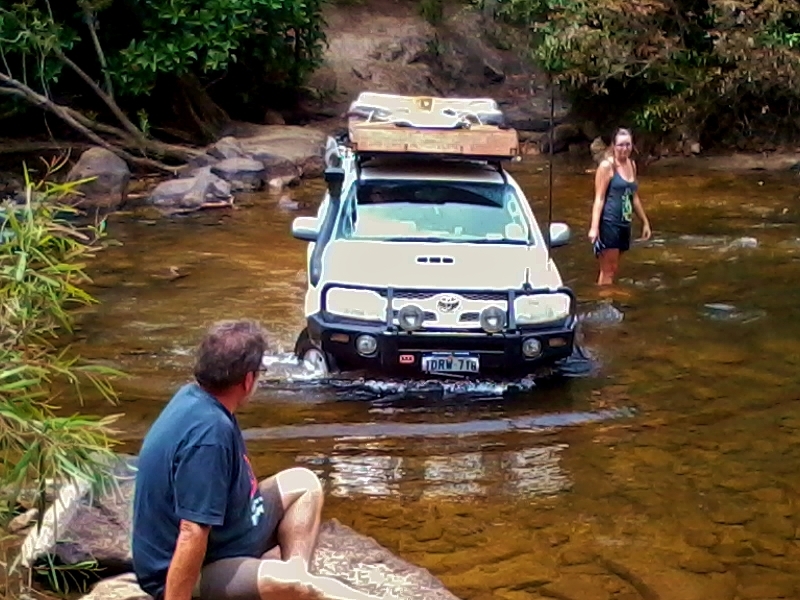 Wenlock River crossing was a piece of cake when we did it in the late dry season. If it’s very wet or if you’re towing then you may have issues exiting the Wenlock river valley. Some winching may be required. This is where it gets serious. The Pascoe River crossing is about 16km from Portland Road. The river is deep and the track into / out of the crossing is very steep and uneven. The western side is the most difficult side since it’s strewn with large rocks. It’s extremely uneven. The eastern side can be quite difficult too if it’s wet since it can become muddy and very slippery. 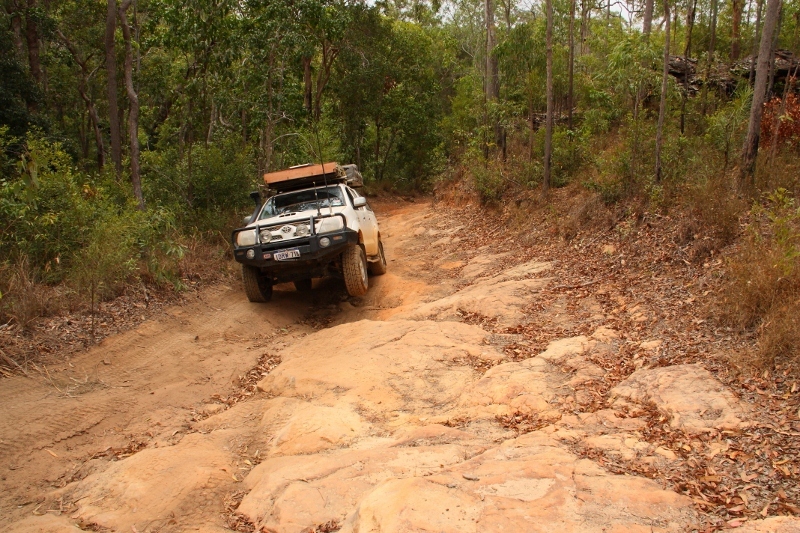 Pascoe River west side is very steep and rocky. Check out the big boulders on the west side. 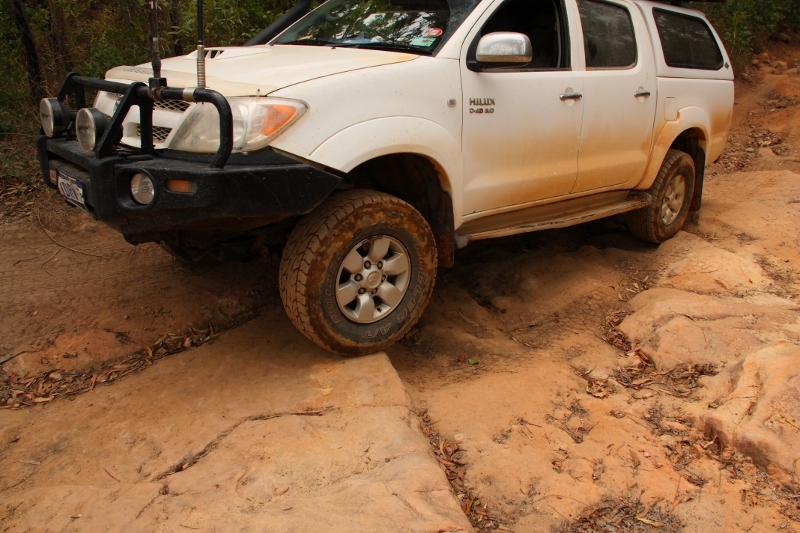 Pascoe River eastern side is quite steep and can be slippery when wet. 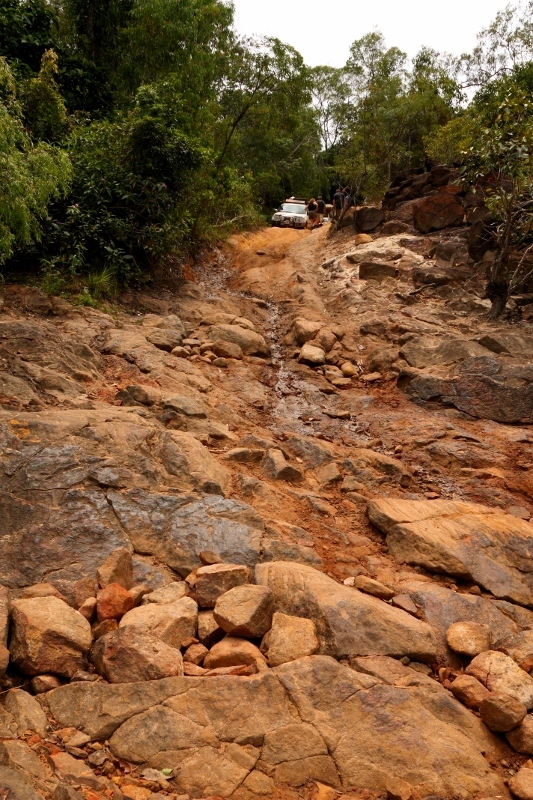 Doing the track starting from Telegraph road (travelling east) is preferable since the most difficult part of the Pascoe crossing is downhill. We did it the other way, starting from Portland Road heading west. Whilst descending the eastern side our side steps mildly contacted the ground on the most uneven section. We have a 40mm lift kit but our vehicle was heavily laden for long term touring and had just been restocked with fuel and water at Cohen. 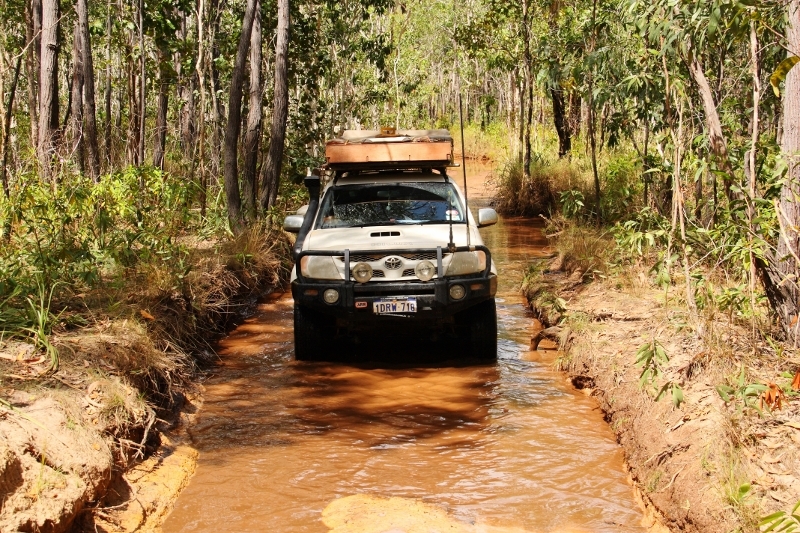 Walk the Pascoe River Crossing before driving it. Note the larger rocks that you want to avoid and plan your route. Even in the middle of the dry season the water level is deeper than your average crossing – perhaps around the top of the wheels. But it’s quite doable. The river bed is firm and rocky and traction is adequate. The level is high enough to leak into your tailgate and doors so be prepared. We jammed a towel into the tailgate and sealed the door drain holes with bluetac. It was late dry season when we completed the track. 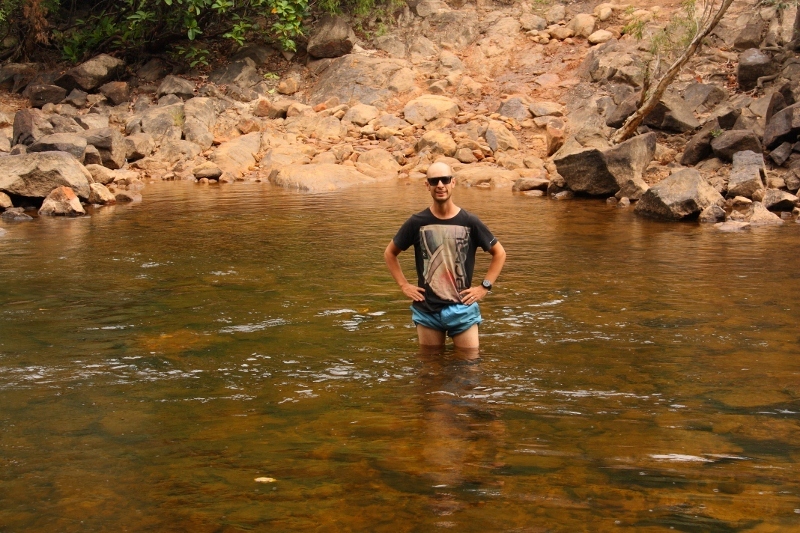 Crossing the Pascoe River with a spotter standing on the biggest rock that must be avoided. Watch out for crocs! 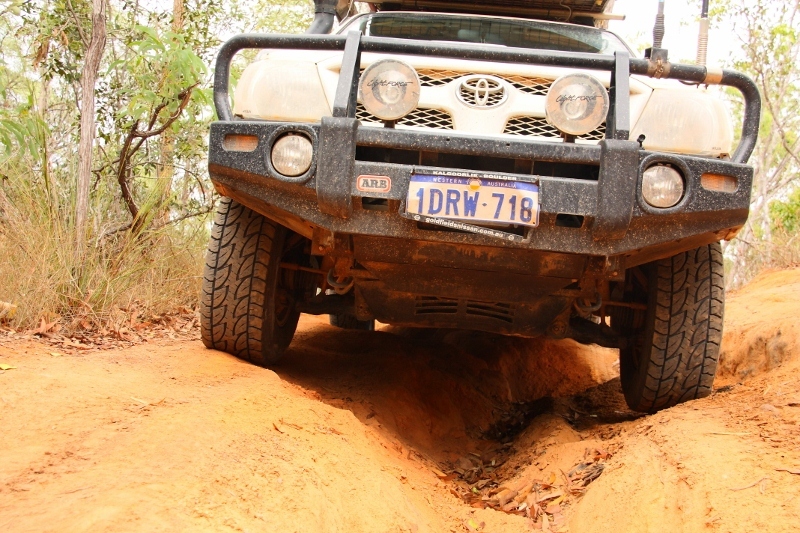 I stalled it and ripped off my mudflap when ascending the western side of the Pascoe River valley. I was going too slow when mounting one of the bigger rocks. Generally the hilux wont stall in first gear low range. It’s never happened before. But those rocks were damn big. I’d recommend a vehicle with a diff locker to tackle Frenchmans Track. A small lift would also be helpful to avoid bottoming out. 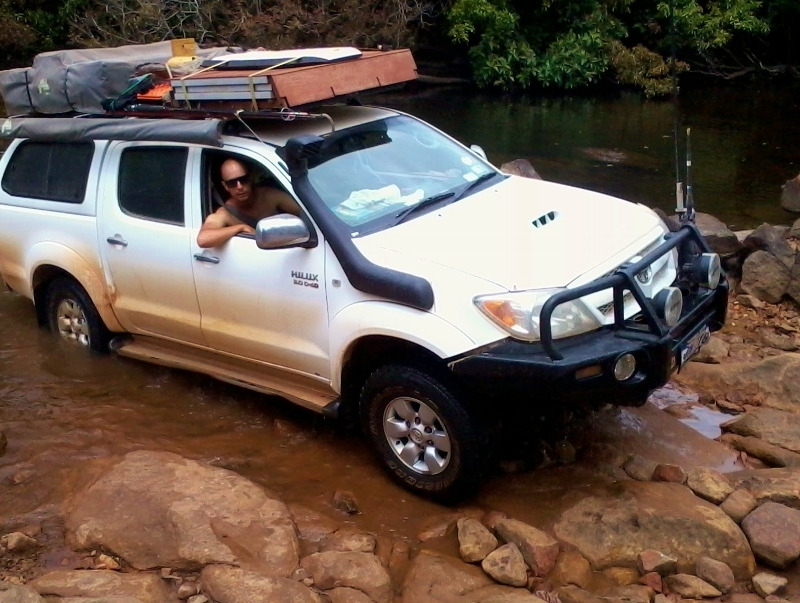 The steep and uneven entry and exit into and out of the Pascoe River is the reason for this. I’ve seen vehicles without diff lockers do this type of thing and it’s not a pretty sight. It requires too much speed and wheel spin. It’s done with the engine roaring at high rpm and multiple repeated shock loads through the drive train as traction comes in and out. I don’t like the stress it puts on the vehicle. Something might break. But it’s definitely possible to do in a standard vehicle and if you don’t mind a few dents in your side steps and the occasional liberal use of the throttle then go for it. Do it in an easterly direction to minimise the stress on the vehicle. If you have a diff locker, a small lift, some experience on steep tracks and it’s the middle of the dry season then give it a go I reckon. 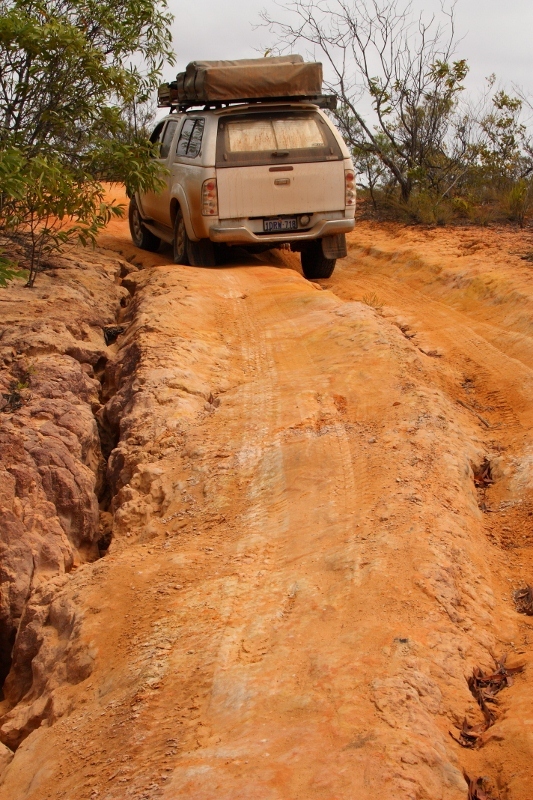 It’s a fun track through some awesome remote country and beautiful water crossings. With your diff locker you can slowly and gently clamber up and down the steepest sections. With a small lift you can avoid bottoming out. Personally I would not do Frenchmans Track if I was towing something. Again it’s too harsh on the vehicle. It also damages the track. But it can be done. Others have done it before. If it’s the middle of the dry season you should not have any problems with the depth of water in the Pascoe River but it depends on how much rain there’s been. Expect the level to be around the top of your wheels. A snorkel is most likely not necessary but still preferable just for piece of mind. If it’s been raining or if it’s early in the dry season then I’d want a diff locker, small lift, snorkel, a winch, some mud tyres and another vehicle to come with me. 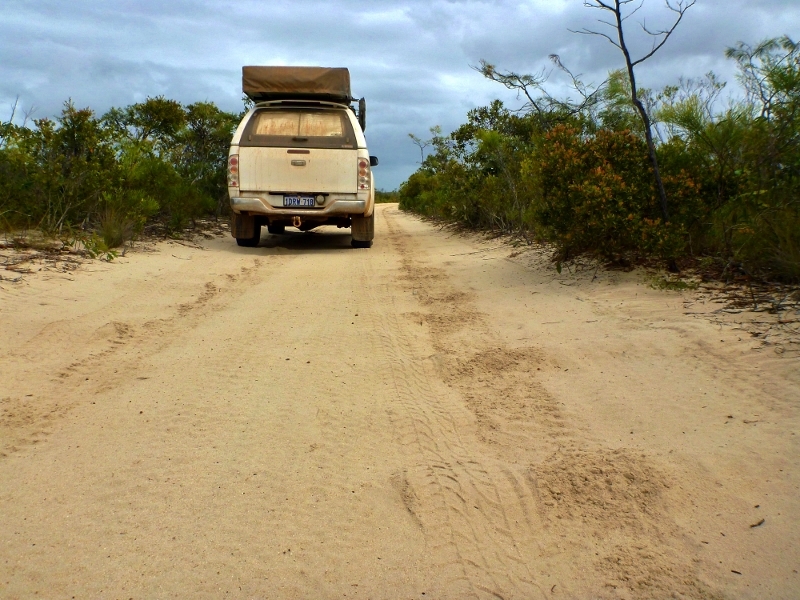 I hope this article helps you planning your travels up Cape York. Good Luck!